One of my first retirement challenges is to complete 100 of the best walks in the UK, as a way to increase my fitness, but also as a way to introduce myself to many areas of the UK that I’ve not visited before. As my fitness builds I’m going to be starting 100 of the best hikes in parallel, walks being easy and 4-6 miles and hikes being more challenging 6-12 miles. The 100 best walks and hikes have been pre-determined by books of those names. For my first walk I chose an old favourite, staring at the wonderful #4 cafe, that used to be called Bowness Cafe, which I’ve been visiting on-and-off for probably 20 years. It does a fantastic ‘classic’ bacon and eggs with some of the best toast in the UK, top quality! Well fuelled by by #4 I head down to the lake and then wind my way up through south Bowness hotels and guest houses to a very narrow footbath that leads up to Post Knott, a superb viewpoint over the lake and a great rest stop that’s much appreciated before the steep climb up to Brant Fell which provides another superb viewpoint. I’ve climbed to Brant Fell many times, sometimes with the kids and it’s dodgy in the wet or ice, the twins once slipped, and slid, down it’s steep muddy, grassy, side on the back-sides: they were not amused. 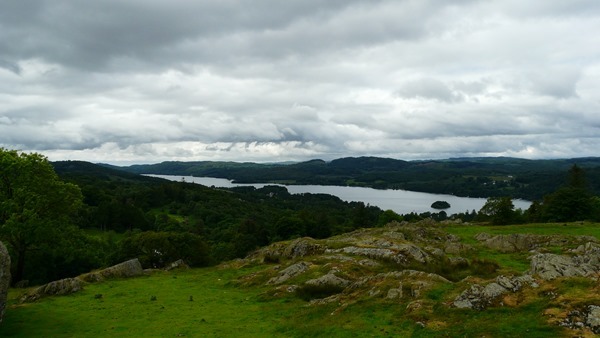 The view though is one of the best in the Lakes, even on a cloudy morning (it cleared up shortly after). From there I add a short loop into the walk that brings me back to Post Knott, which provides fantastic views of the rural lakes, before a nice shaded walk that leads through some amazingly green farmland. I love this side of the lakes, not the fells, but the working grassland farmland and it’s beautiful farms. 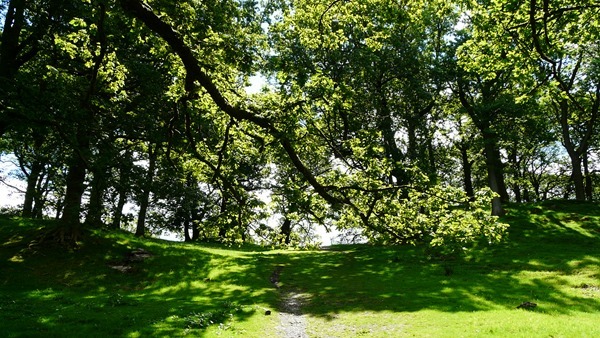 This rural part of the walk provides some of the richest green’s I’ve ever seen, a benefit of lot’s of rain and sunshine and well manured grassland, this part of the walk also provides some glorious shaded sections, which particularly benefit from the sunshine, shimmering through the canopy. 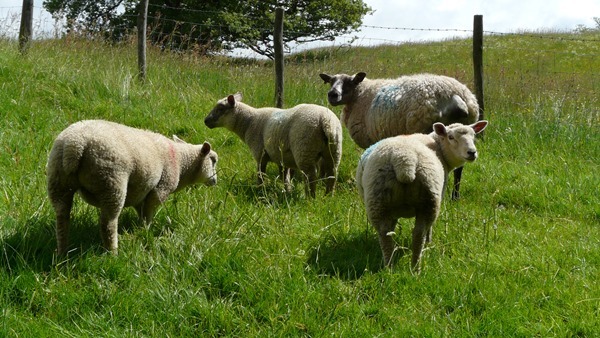 I just love walking through the farms, it’s easier going than the fells and I get to do a bit of sheep watching, unfortunately I’m a little late on this walk to see the lambs hopping about, but I wasn’t disappointed as sheep never fail to delight. 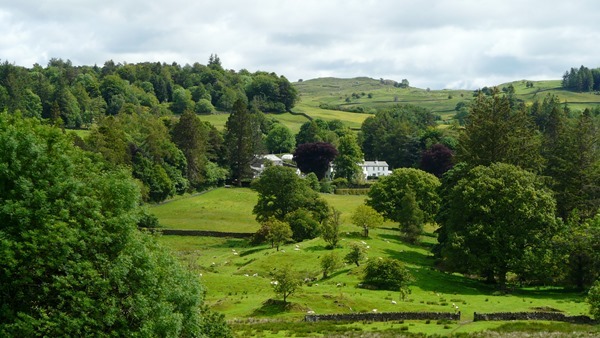 Leaving the farms, it’s then a short walk back up to School Knott that provides a glorious view of Windermere and Bowness with their mountainous backdrop (see above). 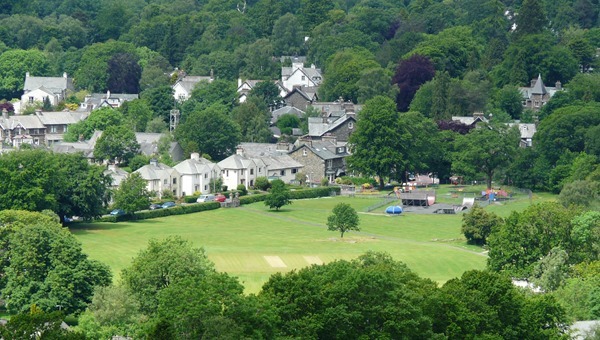 I like to walk down through Windermere town from here, enjoying the park and stopping off at Booth’s supermarket for a snack (they have a nice cafe there too) and then walking down the main street which allows me to soak up the quaint houses and hotels and look enviously in the estate agent windows and browse the outdoor-pursuit shops. It provides a nice gentle wind down to the walk and deposits me back at the car-park. I tend to park in the centre now, just opposite #4 cafe, it costs £5 for 4 hours which is perfect for the walk, if it’s topped and tailed by a cafe break. I mapped the walk (below) with the iOS app Outdoor’s running unattended on the iPad in my backpack. This is my preferred way to map, because running on the iPad I save my iPhone battery and I get a nice high resolution screen-grab of the Ordinance Survey map of my route. 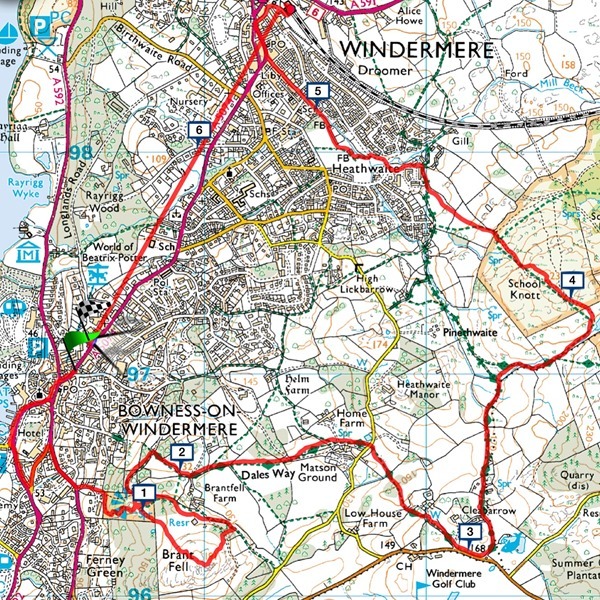 I’m writing up this walk while sitting in Caffe Nero in St Annes, my go-to cafe in rest days. 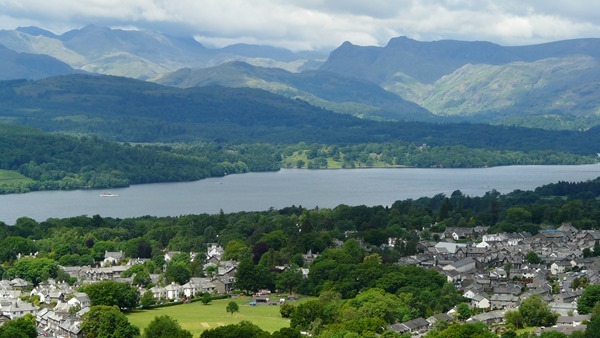 The picture I’ve chosen to decorate the top of this post is of Windermere/Bowness nestling by the lake and dominated by mountains, just glorious!